A gory injury suffered by a rider during Paris-Roubaix last Sunday has forced the UCI to halt its trial of disc brakes in the professional peloton. Fran Ventoso, the Movistar rider, was taken to hospital during the race with a deep gash to his leg that he claims was caused by crashing into a bike equipped with disc brakes – technology which use a separate metal rotor to provide a braking surface, rather than using the rim of the wheel itself. 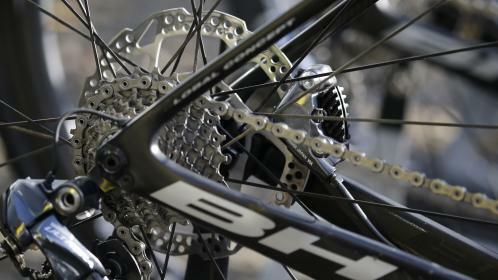 Ventoso was supported by riders from other teams who complained that the UCI had sanctioned disc brakes while ignoring concerns about using technology developed for mountain-biking to a road-racing environment, where cyclists ride in close proximity. Equipment manufacturers are keen to use the professional peloton to advertise the technology, which requires consumers to buy an entire new frame.